The Community Players of Hobbs: Mulan Jr. Tickets on sale now! 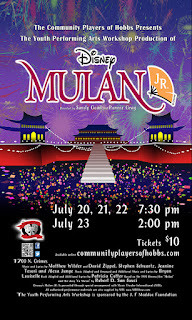 Tickets are on sale now for the Youth Performing Arts Workshop production of Disney's Mulan Jr.
Show dates are July 20-22 at 7:30 and July 23 at 2:00. Tickets are just $10. Don't miss your chance to see this fantastic production, our youth workshop performances often sell out!